This is a full color poster made by the Ministry of Rail Road in 1930 to attract foreign tourists. 7000 copies released to the United States and 2000 copies to the European countries. The artist is YOSHIDA Hatsusaburo. 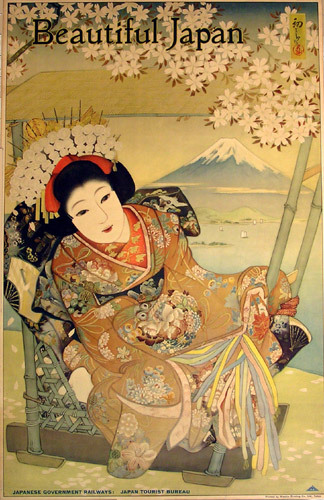 Beautiful Japan is a national campaign title to attract foreign tourists after WWI period. In 1917-18 Russian born Jewish American cinematographer Benjamin Brodsky tripped all over Japan and filmed "BEAUTIFUL JAPAN" supported by Japanese Imperial Railway. This site is a result of intensive research on unfinished film "BEAUTIFUL JAPAN" and Benjamin Brodsky himself by the author, OKADA Masako.